1)	Kids are the perfect height for kissing. 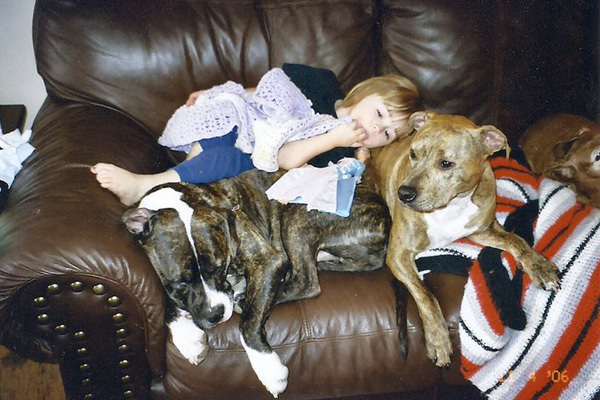 2)	Sharing is easy: Multiple dogs and kids can all fit on the couch together! 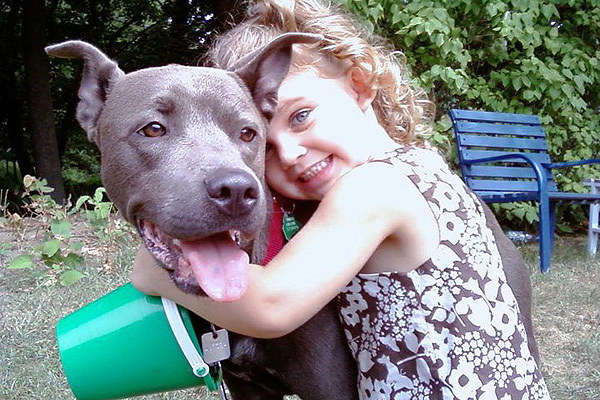 3)	Children are soft and squishy for cuddling – and so are pit bulls! 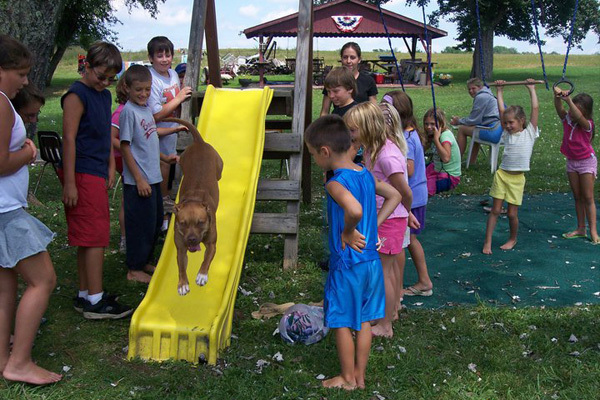 4)	Kids love to play as much as dogs do. 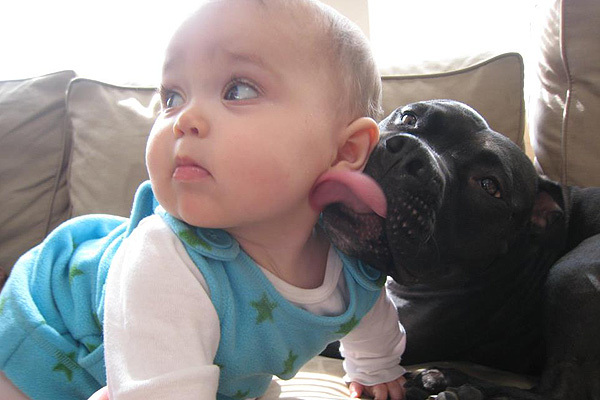 5)	Little ones and their pit bulls can speak without saying a word. Editor’s note: It’s important to teach children proper dog etiquette, and always supervise their play (this is true for all breeds!). Here are some tips from the ASPCA. Pit puppies soon discover chips and cookies held by munchkins are easy to reach. Then it becomes a game for kid and puppy. @starscreeam Oooh…that’s a good one! Thanks! I’m thinking your fans can help create five more with pictures to match! @Anne We’re thinking the same thing Anne! 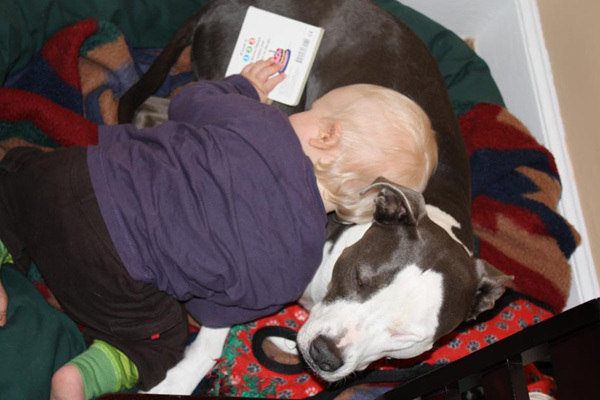 Pitties and Kids can be a great combo! This reminds me that way back in 1970 when my daughter was a year old and we lived in the foothills east of Sacramento, I used to leave my pit bull Frances in the playpen on the lawn with the baby to keep the rattlesnakes out. Yes, I can’t believe I was so clueless, but of course Frances was perfectly well-behaved and thankfully, so was the baby! I would never never do this now, but I think it speaks to the wonderful temperment of our pitties so I thought I’d share. DO NOT repeat my bad behavior though, no matter how much you trust your dog! allybenbrook, you made me laugh. When I think of all the things we did with our prior dog that I would never do now after learning so much more about dogs. In fact, my husband and I often say we want our Mocha back (a Lab-boxer mix with anxiety issues) for do-overs.